Most professionals working in building conservation will have been involved in the conversion of farm buildings, particularly barns. Wherever they work, conservation professionals should be familiar with local variations, such as the large threshing barns of the south east and East Anglia, or bank barns in the north west, which were built into the hillside so they could be accessed from two levels. A variation on the bank barn can also be found in the south west where crop storage and threshing was combined with cattle housing. In some areas where there was extensive rebuilding of farmsteads in the mid- to late 19th century, the barn was reduced to little more than a room in a range where machinery was used to thresh grain crops. Although there is often great interest in farm buildings, there can also be a surprising lack of awareness and understanding of the development and features of traditional farm buildings. From experience, there is sometimes a rather simplistic view of what a barn was and how it should be converted. A farmer in the Welsh Marches lamented to a heritage consultant the difficulty he had with his local conservation officer over the conversion of his barn. He had wanted more first floor space and windows to the upper storey, but this had not been permitted and he had been encouraged to use a large existing opening for light. 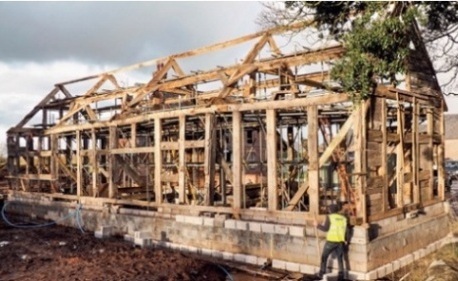 The heritage consultant examined the building, then in the process of being converted, and quickly identified it as a nationally rare example of a 17th-century timber-framed cow house. The building would have been floored end to end and with a series of pitching doors along the front elevation, and had been converted for crop storage by removing the loft floor. Originally, the large opening would not have existed, and had been created more recently to allow machinery to access the building. Through insufficient assessment and understanding of the origins of the building (and the fault for this lies with all parties involved) we now have a 17th-century cow house converted to residential use but made to look like a threshing barn. From any perspective this has to be regarded as a poor outcome which could easily have been avoided. Historic England’s farmsteads and landscape character statements, which have already been published for large parts of the country (and are soon to be completed), aim to give an overview of the various building types and their features that might be expected in a particular area. Awareness of what one might find on a farmstead is important – not knowing what to look for obviously makes finding it problematic. This article will focus on threshing barns, examining some of the smaller features of their construction and evidence for original uses or reuse which is not always identified and thus may not be considered in assessments of significance or proposals for conversion. It is hoped that this brief study will make clear that more frequent use should be made of recording of buildings prior to conversion, so that whether these features are concealed or removed by the development, a publicly accessible record will be available for present and future researchers. The most obvious function of the barn was to store the grain crop and process it by beating small quantities of the crop with a flail to shake the grain out from the ears. This process took place on the threshing floor, usually, but not always, lit by large double door openings to both sides. Whereas it was common for barns to have floors of beaten earth, the threshing floor needed to be more durable. The large double doors to either side do not always indicate that carts were driven through the threshing bay to unload but often this was the case (if not, the cart would be backed out) and so the threshing floor had to withstand vehicles and horses passing over it as well as threshing. Threshing floors were usually formed in stone flags, timber boards or brick, timber being recommended by some agricultural writers in the late 18th and early 19th centuries as it was considered less likely to bruise the grain. Today, many barns have had their historic floors replaced or at least covered with concrete to facilitate modern machinery, but occasionally evidence for traditional threshing floors survives and so has evidential value. The distinction between the threshing floor and other parts of the floor of the barn could easily be incorporated into conversion schemes, reflecting the distinct use of this part of the barn. Once threshed, the loose grain had to be separated, initially from the stalks and then from the chaff, through a process known as winnowing. While a sufficient quantity of grain was built up through threshing, the grain and chaff mix collected after each round of threshing could be stored in corn holes. 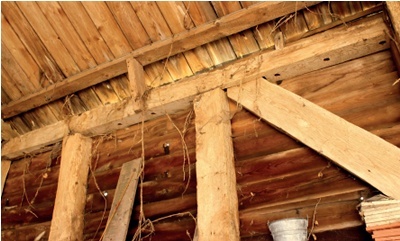 These features are most often found in aisled barns where the temporary storage area would be created by forming boarded walls to the aisle section of the bay adjacent to the threshing floor. An alternative form of storage was to create a raised floor area where the sacks of grain could be stored while awaiting winnowing, the raised floor keeping the grain off the floor and out of the immediate reach of rodents. The form of construction of such features may give them a rather ad hoc appearance and they are easily mistaken for later additions of little note. As a result, such features are increasingly rare and their presence should be at least adequately recorded, even if conversion cannot retain them in the new use. Historically, crop storage and threshing were, however, rarely the sole purpose of barns. Before the 18th century, the barn was probably the largest working building on the farmstead, and in many cases it would have been the only working building. As such, it would be pressed into performing many functions. In some areas there is evidence to show that barns which now stand as a single space open to the roof, were in fact subdivided, sometimes with floored bays defining areas that could serve as cattle housing and stables with haylofts. It has been shown in the Weald of Kent and Sussex that this was a common arrangement in the medieval period and into the 17th century. Some early barns in Hampshire also show a similar multi-functional arrangement in their primary form. Clearly, when considering the possibilities of reuse, the evidence for such subdivision and flooring is of high significance and is contrary to the belief sometimes encountered that barns were always single spaces open to the roof. 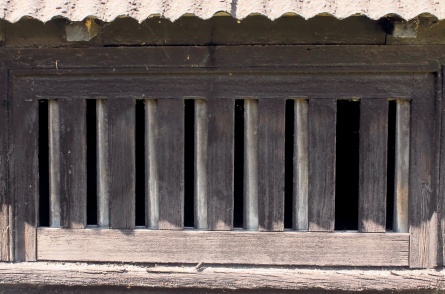 The evidence for partitions or floors can be slight; in timber framed buildings it may be some void mortises in the soffit of the tie beam or mortises in the inward faces of principal posts. Such evidence, if identified, may easily be dismissed as signs of the reuse of timbers from earlier buildings rather than evidence of the original form of the host building. In one large Hampshire barn formed by two linked barns set at right angles to each other, one of the barns incorporated a three-bay structure that was evidently fully floored in its original form and had been reused to form an aisled barn. This earlier framed building, possibly a 17th-century or earlier stable, was probably of greater interest than the barn range (which was otherwise cobbled together with bits of other buildings) because pre-18th-century farm buildings other than barns are relatively uncommon. It did, however, guide the proposals for conversion in terms of where to insert upper floors within the barn. The removal of partitions from early multi-functional barns may have been associated with increasing yields or expansion of the arable area being farmed, with new purpose-built structures being erected for cattle in particular, sometimes within lean-to structures built against the sides or ends of the barn, bringing the original barn structure into a single-function use. Barns in many parts of the country show that at some stage there has been a local shift away from arable agriculture towards pastoral farming. Former barns in the Peak District, for example, had their threshing doors blocked up when they were converted to animal housing. This was sometimes associated with the development of regional specialisation or in response to market conditions, as in the chalklands of central southern England in the late 19th century when the sheep and corn farming systems came under heavy economic pressure due to plummeting wheat and wool prices. In some cases farmers responded to this by attempting to increase production of corn, ploughing up the downland and replacing the massive sheep flocks, which had for centuries maintained the fertility of the soil, with cattle housed in fold yards, sometimes created as ‘outfarms’ in the downland some distance from the main farmsteads. Here the manure from the cattle would be trampled with the straw to be used as fertiliser on the fields. However, some farmers responded to the challenging market conditions by diversifying into dairying, particularly producing liquid milk which at that time was not threatened by cheap imports. This change resulted in a large number of barns finding a new use as cow houses and milking parlours. The evidence for this change of use may only be tethering irons to show that cattle were stalled in the building. Occasionally timber partitions forming the stalls survive but, as with most cattle housing, these fittings are increasingly rare. What significance do we now put on the evidence for the cow house phase of a barn’s history? From experience, it is an aspect which architects, owners or conservation officers have little interest in either retaining or recording. In the case of timber-framed barns, walls covered by horizontal weatherboarding are a common sight. However, before the 18th century this form of boarding was not universal. Barns of 17th-century date in the Weald are known to have had wattle and daub infill panels at least to the upper panels of the barn, leaving the framing exposed as is more common in some areas such as the West Midlands. Vertically set boarding is also known. In a Hampshire barn dated to 1296-1304 the boards were set into a groove in the underside of the wall plate, while a cruck barn of 1441 had vertical boarding set into a rebate around the external edges of the framing. 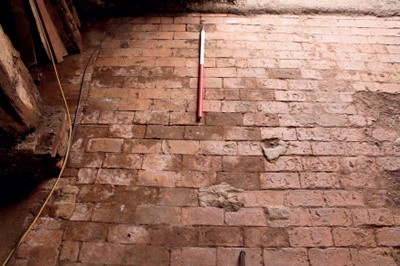 A small amount of this vertical boarding, nailed into place, survives in the gable end of the latter barn which was extended, so preserving a small fragment of this early boarding on what became an internal wall. Similarly, where aisles or later lean-tos have been added to barns, early wall cladding can survive. It can be easy to forget just how differently the occupants of, for example, 17th-century houses would have viewed some aspects of their world, particularly in regard to superstitions and customs. For some there was a real and tangible fear of witchcraft and people would take preventative action to ward off witches and other evil spirits from their homes and buildings important to their livelihoods. 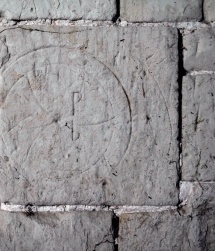 Apotropaic marks in farm buildings provide important evidence of attitudes to dealing with risks that were perceived as real. Many apotropaic marks are circles – singular, decreasing within each other, or in the familiar petal pattern. Others use arcs, crosses and the letter ‘M’ to signify the Virgin Mary. This aspect of the lives of rural folk and their approach to securing their homes, animals and crops deserves greater attention. Alongside apotropaic marks, the importance of historic graffiti is perhaps now being given a greater level of significance than it has in the past and Historic England has produced guidance on recording historic graffiti. Occasionally, inscriptions or dates relating to the construction of barns are found but more commonly one finds initials, sometimes with dates, being carved or written by children living on the farm. In some cases these initials and dates can be identified. Tallies and records of crops can also be found. Such graffiti, particularly that recording names, has historic and evidential value as it probably provides the only surviving physical link to these individuals. The conservation and recording of apotropaic marks and graffiti should be carefully considered in proposals for alterations and reuse. Once the principle of converting a barn to an alternative use, whether residential or commercial, is agreed upon, it has been accepted that there will be a level of change to ensure that the building can serve its new use as sustainably as possible. Inevitably, some historic fabric will be concealed from view and some lost. The point at which planning permission and, where required, listed building consent is granted for a conversion scheme is likely to be the last time the barn will be available for study as a historic farm building (although during building works more of the fabric may be exposed for examination). While the concept of recording to create an archive which will be available to future researchers is a standard process in archaeology, it is still, sadly, an approach which some in building conservation seem unwilling to embrace. Coming from an archaeological background, it is difficult to understand why there is such resistance to securing an appropriate written, drawn and photographic record of a building before and during its transition to a new use that may at least obscure important evidence for the foreseeable future. The application of a condition to secure a programme of building recording must be regarded as best practice and is fully supported by Historic England’s guidance on the levels of recording that are industry standard. It is up to conservation and planning officers to ensure that best practice and appropriate standards are applied and upheld so that we can extract as much information as possible from these fascinating buildings to add to and build upon the knowledge and understanding we already have and, perhaps, to allow those who follow to ask new questions of these buildings. BOB EDWARDS is a director of Forum Heritage Services.